I am writing this blog post sitting on a train heading South from Hoi An (or Danang station) to Nha Trang. I’m not particularly enjoying it. The train itself is pretty slow, and as it left Danang 80 minutes late it doesn’t have much chance of getting into Nha Trang much before 10pm tonight – 2 long hours down, 8 to go. There are toddlers screaming, an incessantly loud TV showing the news and pop videos above our heads, there is a strong and pervasive smell of dried fish and the little girl in the seat in front of me keeps turning round to stare at me – for minutes at a time. It’s ok though, that’s all stuff I can deal with. What I find slightly more unbearable is the creeping toes of the woman behind me, whose grimy bare feet have spent the journey so far nudging across my shoulders and towards my ears as she tries to find that extra bit of leg room, unfortunately in the space that my head is currently occupying. Nick is experiencing a similarly raw deal. At least this train trip is not quite as bad as the one as the one we took from Hanoi to Dong Hoi on the first leg of our journey South. That one was made considerably worse by the mice. The mice that skipped over me and my bags throughout the trip and even woke me up the only time I managed to sleep, the pesky buggers. I’m sure I caused great amusement to the carriage at one point by yelling very loudly when one rang down my leg and I had to kick it off. At least I didn’t do a Nick and flick a cockroach from my neck at the woman sitting opposite (we don’t think she noticed). So we arrived in a dark Dong Hoi knackered, a little ruffled, and hungry to the point of (nearly) not being able to eat. 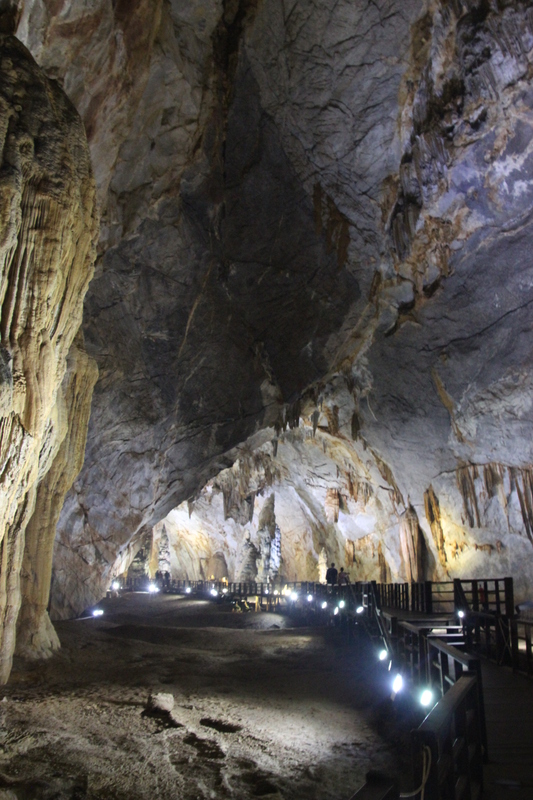 There was nowt much in Dong Hoi itself, but we’d come for the caves in the nearby Phong Nha-Ke Bang National Park, to which we booked a trip from our hostel the next morning. 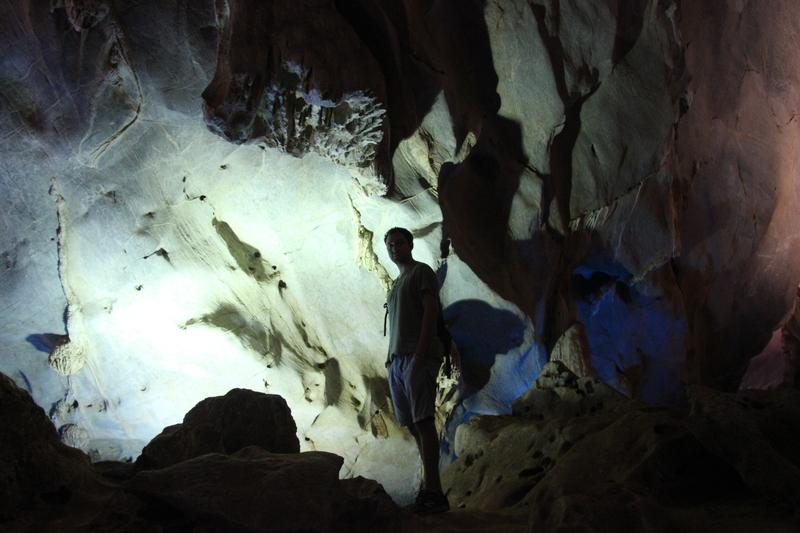 The caves were well worth the stopover on our journey South. 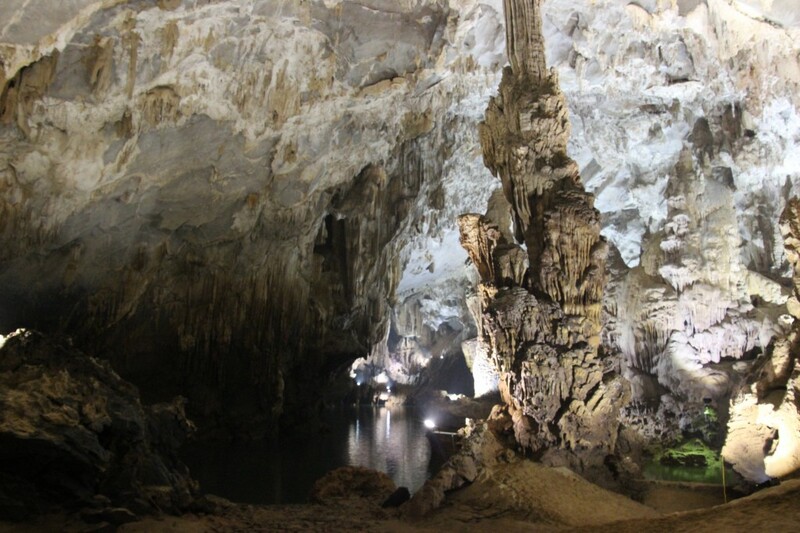 The first we visited, Phong Nha, is apparently home to the longest underwater river in the world. IN THE WORLD. The river stretches for 44.5 km all the way to Laos (although the only entrance to the cave is on the Vietnam side) and we travelled for about 1.5km of that in a long boat before alighting and coming back to the entrance on foot. This cave is home to the weirdly named ‘fairy cave’, which as far as we could tell didn’t actually contain any fairies but it was aptly ethereal, all lit up by the brilliantly placed electric lights that cast shadows in the shape of crocodiles, dragons, rats and all other sorts of things that the guides could think of (though sadly no fairies). Is it a fairy? No it's just Nick. 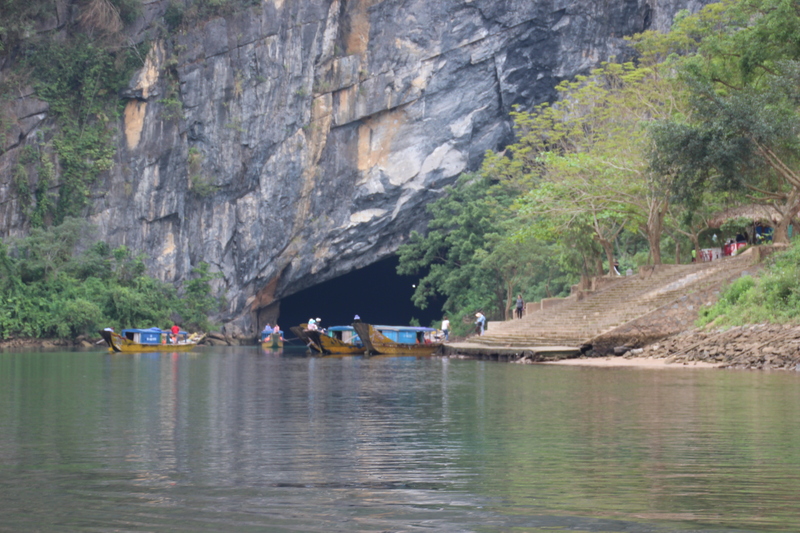 Drifting slowly into the cave by boat was perhaps the most enjoyable part of this cave trip; a wonderful hush descended on the boat as if by mutual consent, and all we could hear was the odd drip of ancient water from the stalagmites (or tites?!) above and the occasional squeak of a resident bat, as the dark enclaves of the cave loomed large at us through the gloom. 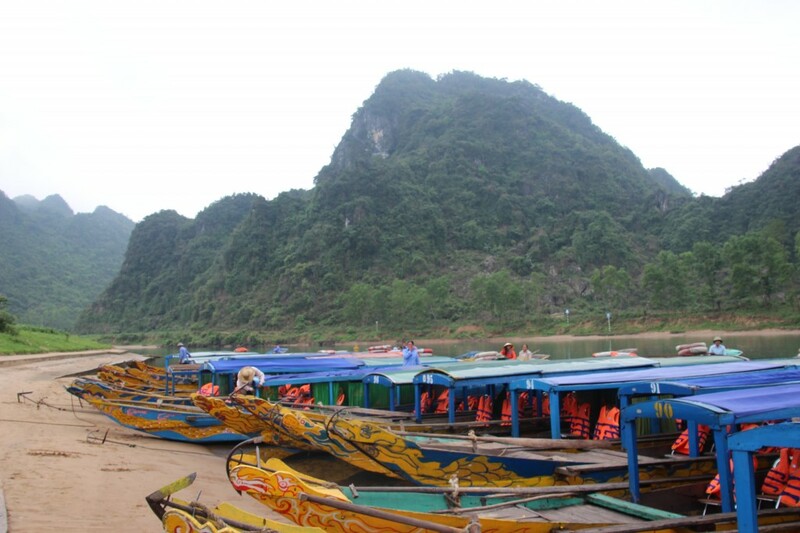 This peace was unfortunately shattered by a boatload of Vietnamese tourists who motored past shrieking, ‘HELLO! !’ at us and snapping flash pictures of the two blonde English kids on the boat behind us. Ah well, it had been getting a bit eerie anyway. A decent lunch was then spent chatting to the family of the said English kids, who were on a really interesting six month trip. Ben and Hannah, at 7 and 5 respectively, were being given formal homework now and again by their parents, Cal and Pete, but were obviously learning a huge amount more from the world surrounding them. The kids were a huge testament to their parents’ decision to take them travelling; not only did they try everything on the lunch table (and even I wasn’t keen to try some of it) but they were confident, polite and really interesting to talk to in their own right. The one thing they (and their parents) weren’t enjoying so much was the scale of attention they were receiving from local people. They were getting used to be bodily removed from their parents’ hands and presented around groups of cheek-pinching and head-ruffling strangers. They handled it very well. After lunch we descended into Hell. No, not really. We actually descended into the paradoxically named Paradise Cave, but it was as if we’d stepped into a painting by the Hieronymus Bosch. The narrow opening of the cave entrance was steep and dark enough to force (even a shorty like) me to stoop as I felt my way along the cold rock and down the slippery wooden staircase, and the damp mist that hung in the air made it hard to grasp the size of the huge cavern we were looking down upon. 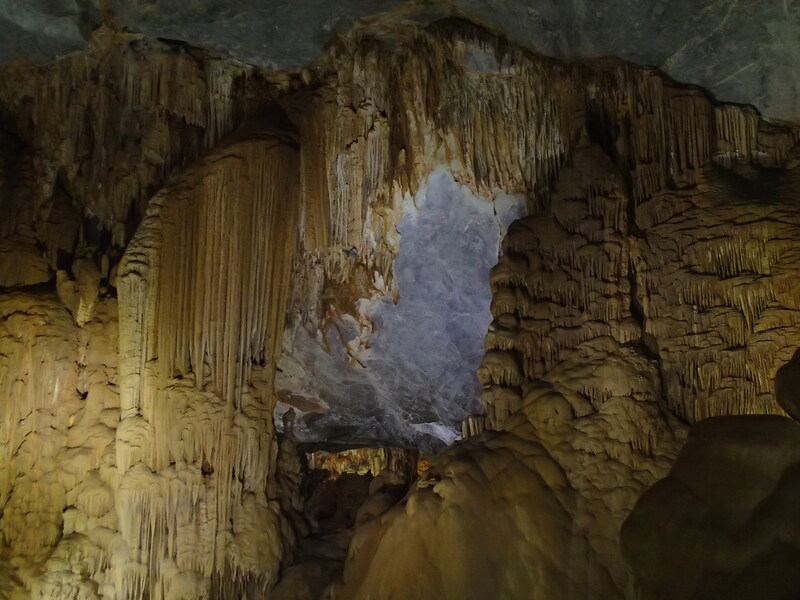 Gradually, through the fog that gathered where the cold cave air hit the hot temperature of the outside world, we began to make out pin pricks of the lights that lit the cave – hundreds of metres below us. 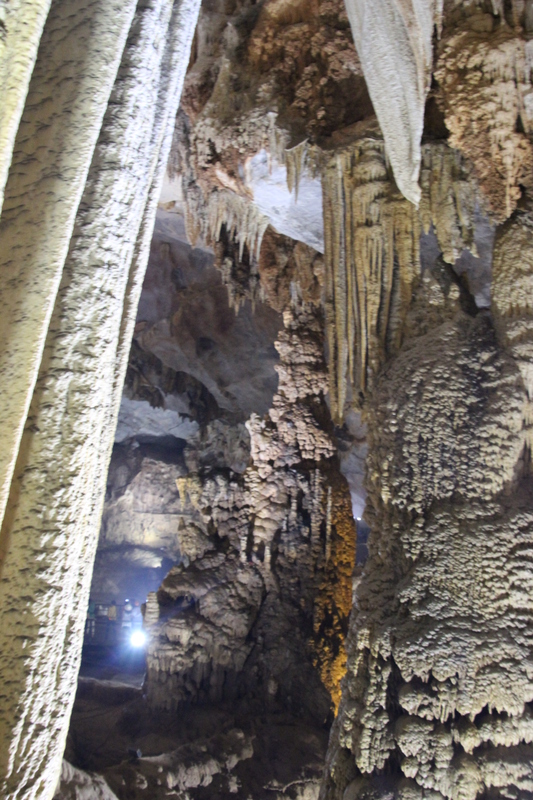 As we slowly climbed our way down the stairs the true scale of the cave became gradually apparent – we were literally walking into the underworld. 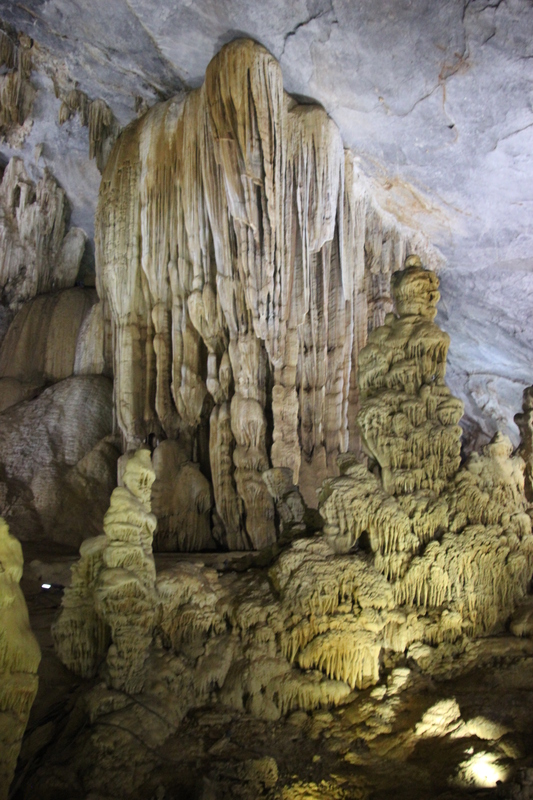 The cathedral-like dome of the cave was titanic. Not only could it have housed cathedrals within, but probably also small towns. The walls seemed to drip with molten stone, but at the same time were cold in their colossal permanence, sculpted into bewildering patterns that seemed against the laws of gravity. As we walked through we found shapes that seemed recognisable – jellyfish, pine cones, pavlovas – but more and more we started to feel like we were in some religious painting, and I almost expected to see frescoes adorning the grey blue stretches of the ceiling. It really did feel like we were walking through some Victorian vision of Hell, or perhaps an Ancient Greek interpretation of Hades’ kingdom – at quiet times when we managed to lose the crowd I could imagine he might suddenly peer round from behind a stalagmite. 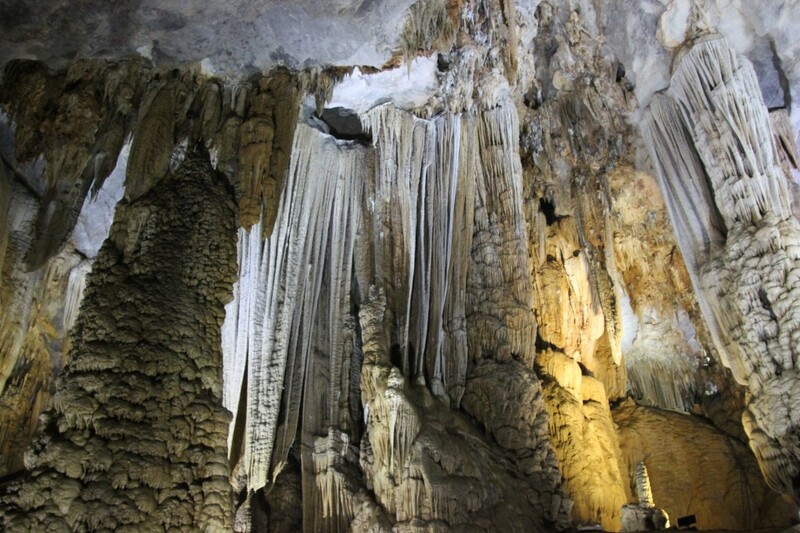 At 31.4km, Paradise Cave is the longest dry cave in Asia. It was officially ‘discovered’ and explored in 2005, which seems remarkably recent for something so prehistoric and so so vast. How the world keeps its secrets from us. 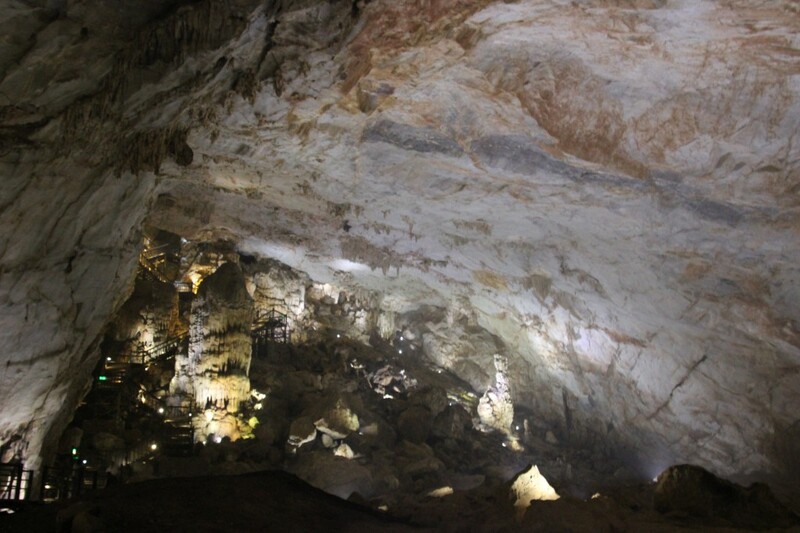 The statistics became pretty irrelevant, however, when walking through the cave, because we felt like we were walking through an environment as alien as the surface of the moon. 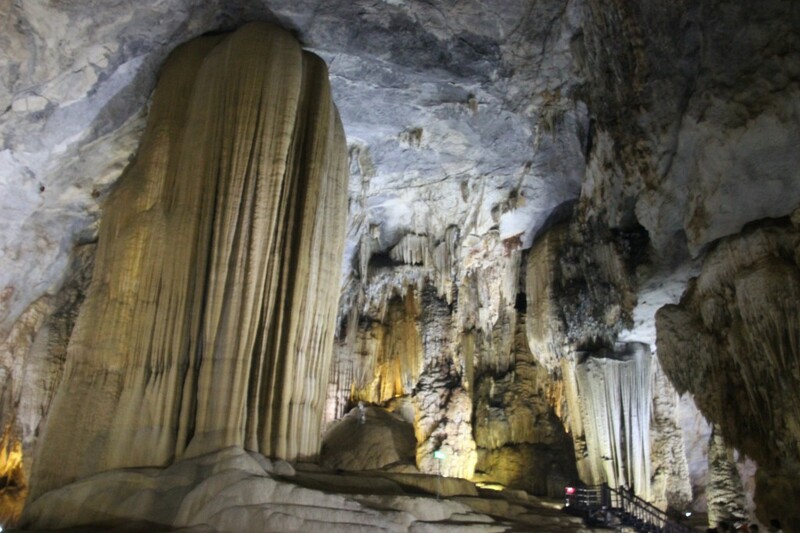 Even time became meaningless; these caves were here before England won the World Cup, before the World Wars, before Americans even existed, before King Arthur, before the Great Wall of China, before the pyramids… you get the picture. The centuries just fall away when up against something so immeasurable. 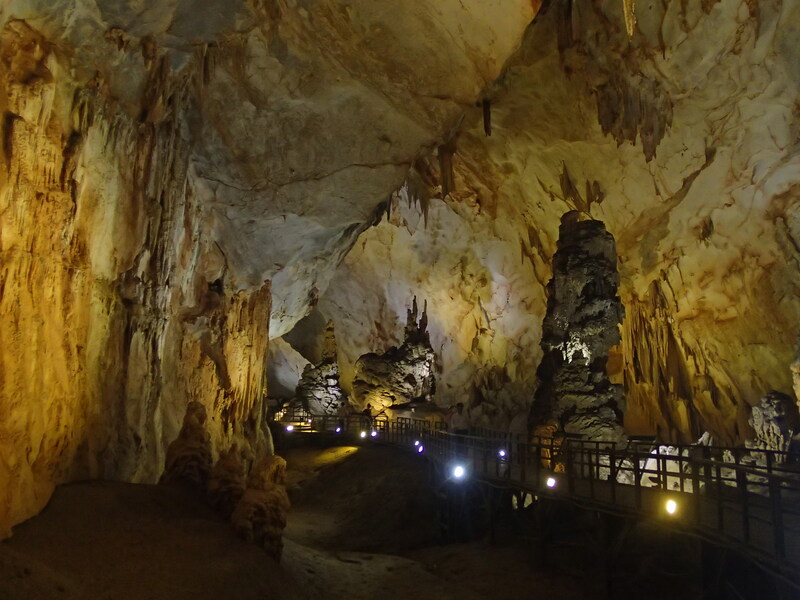 We spent about an hour and a half walking the accessible two kilometres of the cave, and we could definitely have spent longer. Whilst down in the cave it felt like we were far removed from the rest of the world, a spell that was broken far too easily the moment we emerged again into the sunlight of the day. In some ways it is quite calming to think of the caves down there, remaining there despite whatever else the world is up to, reminding us of how small we are really, how none of it really matters all that much, whilst they are reliable in their solid and millennia-old existence, carrying on long before and long after us, whatever happens. Que sera and all that. I just wonder if they turn the lights off at night. NEXT TIME: Haikus in Hoi An (brace yourselves). BREAKING BAD UPDATE: Series 4, Episode 10 (my gosh it’s getting exciting).